Visiting the land of the Bible is a journey like no other. It is a living tour of where your faith began. No two congregations and no two trips are exactly alike. We take the time to understand your congregation’s unique travel needs and interests, and translate them into your own faith-based travel experience. 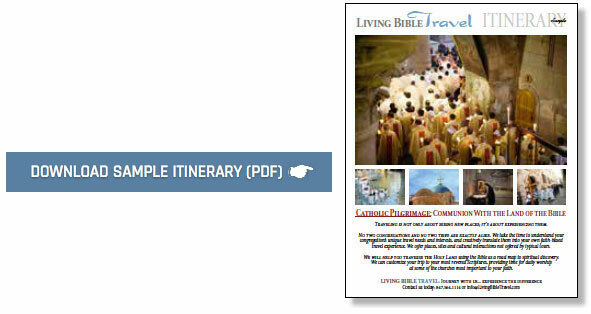 Your travel is easy, safe and more informed with Living Bible Travel. Find answers to many of the spiritual questions you have about your Catholic faith. We customize your trip to your most revered Scripture, providing time for daily worship and reflection at some of the holiest sites and churches most important to your faith. There will be sufficient time each and every day for your group to say Mass in a church, if requested. We will work with the Group Leader to plan where to celebrate Mass. 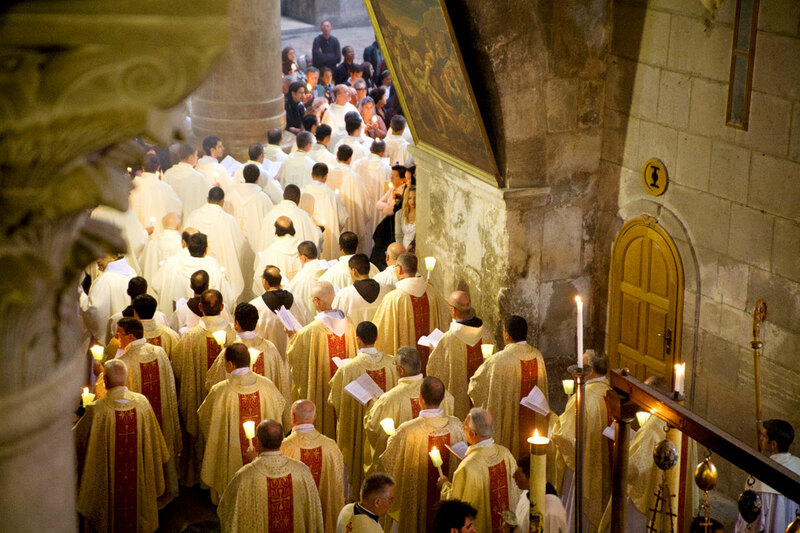 Visit Bethlehem, the birthplace of Jesus of Nazareth. Experience biblical sites such as the Garden of Gethsemane and the Mount of Olives. Touch the same olive trees most likely touched by Christ as he prayed beneath their towering branches. See the Garden Tomb where the foot of Jesus left the earth in ascension. Kiss the stone on which Jesus’s body lay and was anointed after death and before entombment. Walk through the Old City, and sail on the Sea of Galilee. Walk the Via Dolorosa where Jesus carried His cross to Calvary. Hold mass at Calvary where Jesus was crucified. This is your tour. We will help you design and implement the experience you want. Follow the path of our Savior and bring His journey to life. You will create memories of a lifetime with Living Bible Travel. Do you want to immerse in your faith and follow in the footsteps of Jesus, the first apostles and the earliest Christians? Do you want to stress the historical and cultural aspects of these lands? Tell us what you want for your congregation, and we will tailor a journey that engages your mind and inspires your walk of faith with Jesus Christ. Contact Living Bible Travel, today.